Everybody wants to do the right thing, to be the best person they can be, and to help their family and friends to do the same. But why does man have this innate desire to be “good?” What does goodness look like? Are good and evil the same for everyone? Using Aristotle’s Ethics as his guide, John Cuddeback, Ph.D. answers these questions and more, showing how man is shaped by the choices he makes, and how continually choosing the good inevitably leads to happiness. Aristotle’s timeless assertions on the nature of humanity are invaluable in their cogency and simplicity. Dr. Cuddeback’s teaching of the text from a Catholic perspective makes for a deep yet accessible lesson on the profound spiritual dimension of everyday life. The increasing pervasiveness of moral relativism can complicate the modern Christian’s understanding of good and evil. A choice to study ethics is a choice to clarify one‘s knowledge of goodness. If we are confident in our understanding of good and evil, we can more assuredly pursue lives of Christian holiness. Dr. Cuddeback’s lectures are rich sources of inspiration and insight into human goodness, and how choosing goodness means choosing happiness for ourselves and those around us. While the study of ethics is an intellectual endeavor, it pertains to all aspects of the human person. Dr. Cuddeback’s sensitivity to the Catholic’s quest for holiness allows him to apply ethics to our everyday spiritual lives. 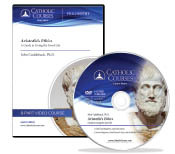 Learn how St. Thomas Aquinas’ own study of Aristotle’s teachings left an indelible mark on the Catholic understanding of virtue. Renew your desire to overcome bad habits by understanding the transformative power of good habits. In this course, Dr. Cuddeback invites you to feed your mind and your soul with timeless teachings on humanity’s pursuit of happiness. Dr. Cuddeback holds a Doctorate in Philosophy from The Catholic University of America. He is Professor of Philosophy at Christendom College, Front Royal, Virginia. He has lectured widely on various topics including virtue, culture, natural law, contemplation, and friendship. His book Friendship: The Art of Happiness was republished in 2010 as True Friendship: Where Virtue Becomes Happiness. His writings have appeared in Nova et Vetera, The Thomist, and The Review of Metaphysics, as well as in several volumes published by the American Maritain Association.